Data for fiscal 2017 executive severance arrangements is derived primarily from 2018 definitive proxy statements filed by 160 major public companies (“Study Group”). 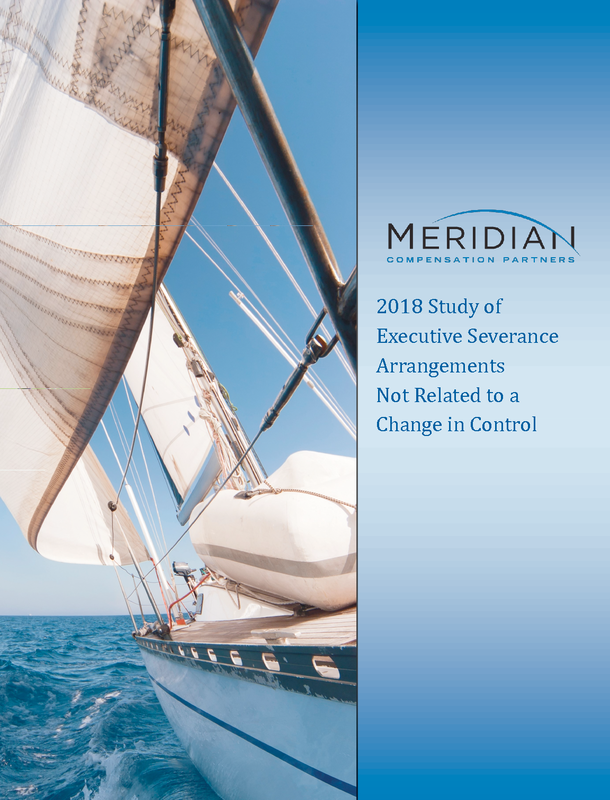 This is only a summary of the full 2018 Study of Executive Severance Arrangements Not Related to Change in Control. To obtain the full report, please contact Donald Kalfen. 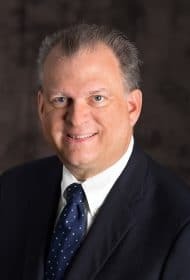 Meridian Compensation Partners, LLC (“Meridian”) is one of the largest independent executive compensation and corporate governance consulting firms in North America. Meridian currently serves over 600 large publicly and privately held clients, including 15% of the S&P 500®. Meridian consultants advise Boards of Directors and senior management on the full range of executive compensation issues that confront them. Whether the subject is compensation philosophy, pay-for-performance, incentive plan designs, shareholder initiatives, change-in-control severance protections, mergers and acquisitions or Board governance, we have the resources, experience and expertise to help. We guide Compensation Committees as they make often difficult, but informed, decisions on executive pay. Our decades of experience provide context for our clients to make sound business judgments. © 2018 Meridian Compensation Partners, LLC. The material in this publication may not be reproduced or distributed in whole or in part without the written consent of Meridian Compensation Partners, LLC. Questions or comments regarding this publication should be directed to Donald Kalfen at dkalfen@meridiancp.com or 847-235-3605. Each of the 160 companies in the Study Group was a component company of the Standard & Poor’s 500® Index2 (“S&P 500®”) as of December 31, 2017. Together they represent a cross-section of the major industry sectors covered by that index. Given that, we believe the Study results are representative of executive severance practices across the S&P 500®. The composition of the 2018 Study Group is similar to the 2015 Study Group. Of the 160 companies included in the 2015 Study Group, 131 were component companies of the S&P 500® on December 31, 2017 and thus included in the 2018 Study Group. Each of the 29 companies no longer part of the S&P 500® on December 31, 2017 was replaced by a comparable current S&P 500® company in terms of industry, revenue and/or market capitalization. Displayed below are revenue and market capitalization statistics for the 2018 Study Group. The Study provides prevalence data on the following aspects of severance arrangements that cover named executive officers3 (“NEOs”): (i) payment triggers, (ii) cash severance benefits and (iii) treatment of long-term incentive awards. However, the Study does not take into account benefits that may be payable to an NEO upon death, disability or retirement, or capture potential enhancements that may be negotiated upon actual termination. Generally, the Study shows prevalence statistics for the chief executive officer (“CEO”) and average prevalence statistics for the other NEOs. We derived data and information for the Study primarily from the definitive proxy statements filed with the Securities and Exchange Commission (“SEC”) by each company in the Study Group. As necessary, we reviewed underlying employment agreements, severance plans or policies, equity incentive plans, and award agreements covering NEOs of the Study Group companies. For the most recent year of data, we examined proxy statements filed primarily in calendar year 2018 that cover executive severance arrangements in effect during fiscal year 2017. Throughout this Study, we reference data according to the fiscal year covered by the proxy statement, not according to the year in which the proxy statement was filed with the SEC. Executive severance arrangements refer to any arrangement that provides benefits to an NEO upon a qualifying termination of employment that is not in connection with or contingent upon a change in control of the enterprise. ■ Securing restrictive covenants such as non-compete, non-solicitation, etc. Executive severance arrangements typically take the form of either: (i) an executive severance plan or policy covering executives by name or by group (the current trend); or (ii) an individual employment contract or severance agreement. Executives also may be eligible to receive severance benefits solely under a broad-based severance plan. Separately, a company’s equity incentive plan or applicable award agreements may provide special treatment of outstanding equity awards upon certain termination of employment events. Executive severance benefits are universally triggered upon an executive’s termination of employment without “cause.” Less frequently, executive severance benefits are triggered upon an NEO’s voluntary termination of employment for “good reason.” The lower prevalence is primarily due to company preference to retain flexibility to modify compensation and benefit arrangements, reporting relationships, duties and/or office location over time, without triggering a good reason event. Often the payment of severance benefits is subject to restrictive covenants and/or execution of a comprehensive release and waiver of claims. Restrictive covenants may include non-compete, non-solicitation, non-disclosure and non-disparagement provisions. Releases and waivers typically prohibit a departing executive from bringing a lawsuit against the former employer for employment-related causes of actions, including actions under the Age Discrimination in Employment Act. The payment of cash severance to NEOs upon a qualifying termination is a widespread practice among Study Group companies. In 2017, 65% of Study Group4 companies reported maintaining severance arrangements that provide cash severance benefits for NEOs, down slightly from 69% in 2014. In 2017, 76% of companies determine the amount of cash severance based on a fixed multiple of “pay,” down slightly from 83% in 2014. ― For CEOs, 61% of companies determine cash severance based on a 2× multiple. ― For other NEOs, 42% of companies determine cash severance based on a 2× multiple and 40% determine cash severance based on a 1× multiple, up slightly from 41% and 37%, respectively, in 2014. ― The majority practice is to define pay as the sum of base salary and bonus (with bonus typically defined as current year target bonus), showing little change in prevalence from 2014. ― For CEOs, the most prevalent severance formula (46%) used to determine the amount of cash severance benefits is 2× the sum of base salary and bonus. ― For other NEOs, the most prevalent severance formulas used to determine the amount of cash severance benefits are 2× the sum of base salary and bonus (32%) and 1× base salary (23%). Treatment of long-term incentive awards in connection with a qualifying termination varies by type of award and, for certain awards, differs between CEOs and other NEOs. For performance shares, 95% of companies determine the number of shares that vest based on actual performance, a significant increase from 2014 (81%). While the provisions of Section 162(m) of the Internal Revenue Code that contributed to this practice no longer apply to new awards, a desire for performance-based pay and a consistent level of payouts for current and former employees may result in continuation of the practice. ■ Release and waiver of claims. 79% of companies condition the payment of cash severance benefits (and generally other severance benefits paid under the same arrangement) upon the timely execution of a release and waiver of claims agreement, up from 67% in 2014. ■ Restrictive covenants. 74% of companies include one or more restrictive covenants in their executive severance arrangements. The most prevalent restrictive covenants are non-compete (91% of companies), non-solicitation of employees (76% of companies) and non-disclosure (74% of companies), with the prevalence of these restrictive covenants generally showing little change from 2014. 1 Available at meridiancp.com or by emailing Donald Kalfen at dkalfen@meridiancp.com. 2 The S&P 500® Index is a registered trademark of S&P Dow Jones Indices LLC, a division of S&P Global, Inc.
3 Named executive officers refers to the chief executive officer, chief financial officer and the three highest paid named executive officers other than the chief executive officer and chief financial officer. 4 Unless otherwise indicated, the remainder of the statistics presented in Key Findings are based on the population of the Study Group companies that maintain cash severance arrangements.